What can I say? I was getting images of this cake in my mind for a long time and finally went ahead and did it. 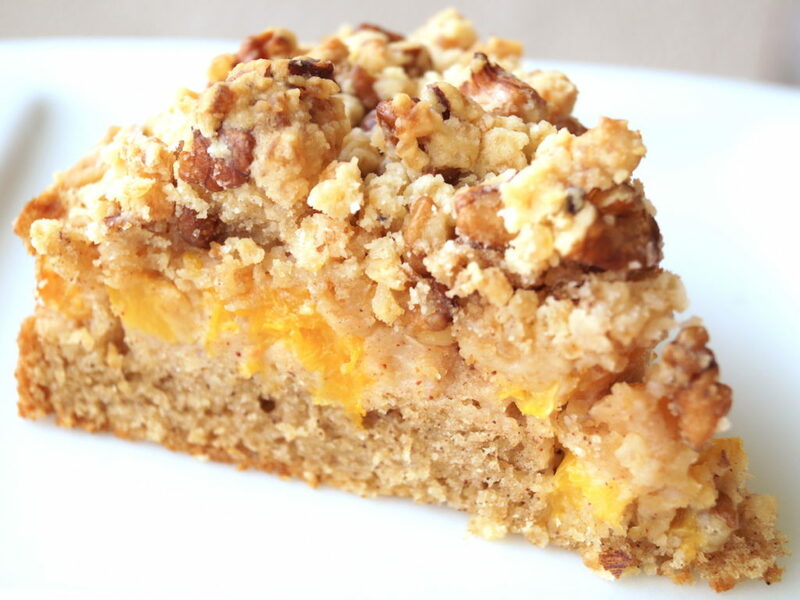 The peaches and cinnamon in a soft cake with the lovely nutty crunchy crumbly topping………………….. My indulgence. Came out well. Very well. Try it. You can have it with a light vanilla custard, or ice-cream, or just on its own. 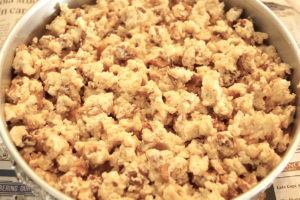 Crumble the butter into the flour and sugar till well mixed, then add the walnuts and mix. Set aside in the refrigerator till you finish your cake batter. Line an 8 inch round baking tin with parchment or butter paper and oil the sides. If you feel the batter is too runny and might leak out, cover the outside of your baking tin tightly with aluminium foil. 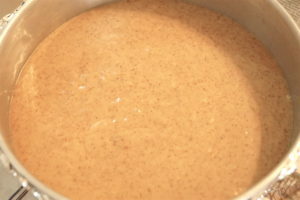 Mix the flour, sugar, baking powder and cinnamon powder in a mixing bowl and set aside. Beat the eggs in a bowl, add the melted butter (make sure it’s not hot) and the milk and mix well. Add the eggs mixture to the flour mixture and mix till well incorporated. Add the peaches all over the top, covering the whole surface. Then sprinkle the crumble topping all over the surface of the peaches. Bake in the centre rack of the oven with only the bottom heating on for 45-50 minutes or until a skewer inserted in the middle of the cake comes out clean. Remove from oven and cool completely. 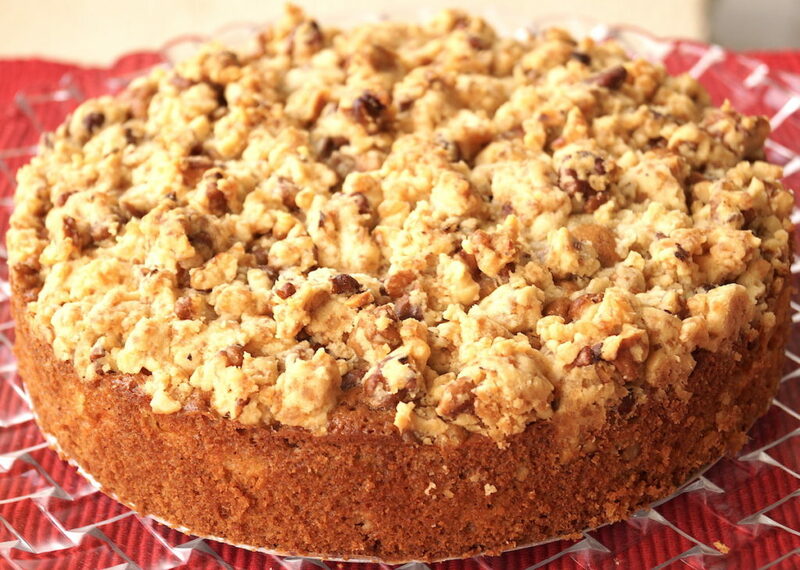 Run a knife all along the edge of the cake to loosen from the tin. Remove onto a serving platter and enjoy. Important notes: I only use the heating rods at the bottom of my oven for baking my cakes. If you have an oven where you don’t have the option of turning the rods on the top off, you can place an oven tray between the rod and the cake. I don’t use ovens which have only heating from the top. Also, if you are using a smaller cake pan, 7 inches, then you may have to keep the cake in for longer. However, do not open the oven door before 30 minutes. Also would not recommend using a smaller cake tin. It will mess up the texture – dry up the outsides in the time it takes to fully cook the middle. 2. 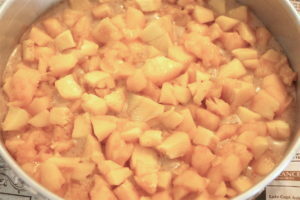 Add the peaches to the cake batter, sprinkling lightly over the top.